It’s always too premature to talk about this. It’s always too pointless to talk about this. It’s also too subjective to talk about this. 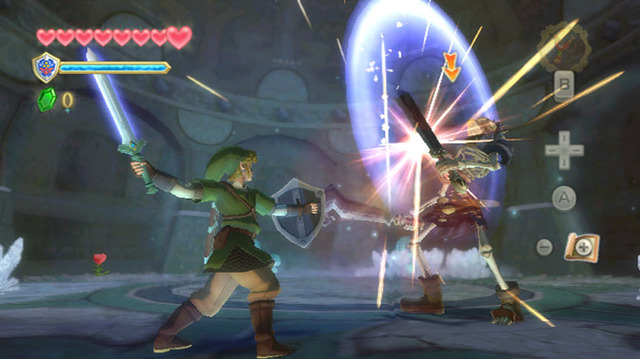 However, talk we shall as now we have so many details for Skyward Sword it’s scary. Is Skyward Sword the best Zelda to date? Naturally we can’t come to any definitive answer until we have the complete game sitting in our laps, but that doesn’t mean we can stop the hype train. Consider this more of a “prediction” question, since none of us can know. Yes, the music is glorious. It’s dungeon background music at it’s pinnacle, with a very big thumbs up to the fully orchestrated track. Still, it’s the little things that due it for me. The quick change menu that creates minimal downtime in switching items and drinking potions – we knew about this last year, but we actually see it in action here. It’s awesome. Then the sound effects when you hit a mushroom? The item discovery chime? Link’s own grunts? It all sounds the best I have ever heard a Zelda title sound. There also appears to be great attention to the small details. Everything we have seen in the videos shows not just a unique art style (woo! Zelda always seems to find a way to show me something I haven’t seen before), but a breathtaking experience. Yes, this is a big nod to the graphical choice, and how it aids a very intense and full atmosphere. It’s way to early to claim this is the case throughout, but one would assume the attention to the atmosphere has been extended throughout the title. It looks extremely refreshing. Yeah.. refreshing… that’s the word for it. We’ve seen some 1:1 controls in Red Steel 2, but we’ve never seen them as fully integrated as they are now. Skyward Sword may end up being the only full motion 1:1 game in the franchise, but it’s not going to be that without leaving a lasting impression. Every enemy feels like a puzzle in that of itself, but not in a tedious manner. You have actual sword motion skills to master, instead of quick button presses in reaction to the screen. Even the old counter attack system sort of “told” you when to hit a button. Now you have to steady your enemies and their defensive positioning and attack pattern, and then strike it precisely at the right angle and at the right time. It will take some getting used to, but it looks very refreshing. That doesn’t even touch base on the brilliant inclusion of the Beetle gadget, or the now very useful difference between the slingshot and the bow. In the end, the question is if Skyward Sword could possibly end up being the best Zelda ever created,. In this writer’s humble opinion it very likely will be. Maybe I am giving the game too much credit so soon, or falling into the Twilight Princess trap. I really could care less, so I’ll just stick my neck out there. Skyward Sword is poised to be the best Zelda game in the series. What do you think?